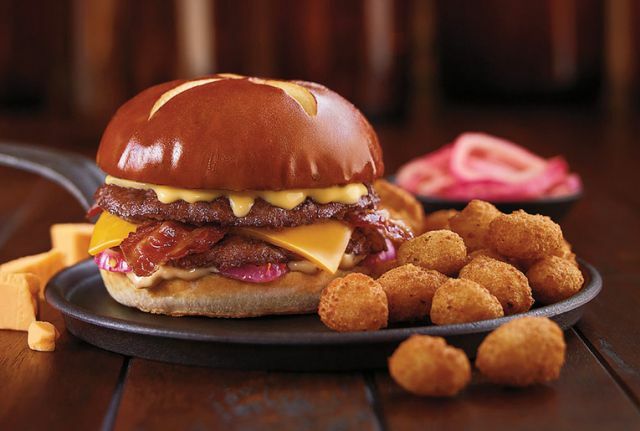 Culver's will be featuring a buttered and toasted pretzel bun and pickled onions in the new Pretzel Haus Pub Burger set to launch on Monday, April 2, 2018. The onions are pickled at each restaurant and are joined in the burger by two beef patties, cheddar cheese, bacon, bistro sauce (a horseradish-and-mustard mayo), and Wisconsin cheddar cheese sauce. The Pretzel Haus Pub Burger will be available through May 27, 2018, while supplies last.